If you ever lost against the Pistons while playing the Bulls, now you know. It had to happen at least once, perhaps even to you. It might have been a Sunday morning with you and your brother crowding around the Genesis playing NBA Jam. He was playing the Pistons, you the Bulls. It was close. You tossed a killer shot, but it got swiped away. You shouted insults at both the game and your brother in equal measure. Secretly, you blamed yourself. 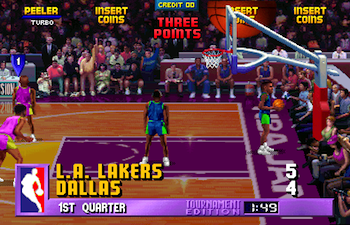 Now, cast off your shame, as it's come to light that Mark Turmell, the lead designer of NBA Jam, tweaked the code behind the scenes so his preferred team would win. In an interview with ESPN, Turmell admits to altering the balance just a bit. "If there was a close game and anyone on the Bulls took a last second shot, we wrote special code in the game so that [the Pistons] would average out to be bricks." The reason? Favoritism. "There was the big competition back in the day between the Pistons and the Bulls, and since I was always a big Pistons fan, that was my opportunity to level the playing field." Hopefully that news can quell any sibling rivalries that still persist. Turmell also shares some other memories of the seminal basketball game, like how Shaq was a huge fan. Apparently, he loved NBA Jam so much he owned two arcade machines: one to keep at home, and the other to take on the road. "[T]hey shipped the game with them on their road trips, setting up the machine in their hotel rooms as they traveled," he recalls. "The players would play, then get someone to pack it up and ship it off to the next city."